Organic Annapolis Valley apples, wild St. Lawrence Valley mint and Labrador tea will leave your hair lustrous and shiny! Enriched with indigenous Canadian yarrow, willowherb and sweet fern for a healthy scalp. Certified organic, gluten-free, vegan, biodegradable. Direction : Apply to wet hair and massage into scalp. Rinse well. Ingredients: Aqua/Water/Eau, Lavandula Angustifolia (Lavender) Water*, Brassicyl Isoleucinate Esylate, Brassica Alcohol, Ricinus Communis (Castor) Seed Oil*, Cetearyl Alcohol, Mentha Piperita (Peppermint) Oil*, Menthol*, Ledum Groenlandicum Water*, Daucus Carota Sativa (Carrot) Root Water*, Daucus Carota Sativa (Carrot) Seed Oil*, Borago Officinalis Seed Oil*, Glycerin, Coco-Glucoside, Achillea Millefolium Extract*, Helianthus Annuus (Sunflower) Seed Oil*, Sodium PCA, , Glyceryl Caprylate, Hydrolized Rice Protein, Comptonia Peregrina Water*, Glyceryl Oleate, Vinegar*, Rosmarinus Officinalis (Rosemary) Leaf Oil*, Anthemis Nobilis Flower Water* * ingredients from Organic Farming * ingrédients issus de l’Agriculture Biologique. It does a good job of conditioning. Love the smell. Very good conditioner for my fine curly hair. Does not weigh my hair down at all. Only dislike was very little slippage on my hair. I had to very gently detangle my hair while wet. But I combined with Green Beaver Gluten free shampoo. When I combine with a different slf free shampoo there is bit more slippage. But I can tolerate a few extra minutes of detangling for the benefit of full hair. I have long straight hair and this is the first natural conditioner I've found that leaves my hair feeling soft and tangle free! Leaves hair silky and the scalp feeling refreshed, the only inconvenient factor for my arthritic hands is the square bottle is hard to squeeze product out, i had to use both hands to turn the bottle up side down , squeeze the product on my shower stool, then scoop it up to use it. 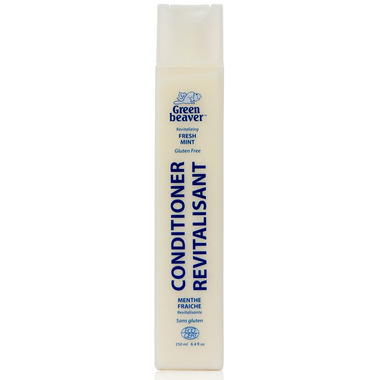 The conditioner leaves your hair in okay shape, but your scalp will feel amazing. I leave it on for a few minutes before rinsing and I can feel a slight tingle for long after my shower. This smells great. Works very well as a conditioner. I've used it twice so far. Results: My hair are nice with it, I wouldn't say super nice but it is natural and I am giving it time. One thing I find weird is when I use a straight iron my hair feels/looks waxy after I applied heat (maybe the Glycerin? - I am not sure). I use the shampoo and conditioner in mint. I love the smell and fresh feel of mint. Unfortunately I had a bad allergic reaction to it on my ears, which is too bad because it conditioned my hair so well and made it feel fantastic without weighing it down. I'm disappointed I can't keep using it.